Our bodies are great. They carry our brains around wherever we want to go, sit us down with a friend for a good meal or make us feel invigorated after a run or a swim. Yoga may have origins outside our culture, but its benefits are now felt within it. The beauty of Iyengar yoga in particular is the revelation that there is a living architecture hidden in all of us that only needs unveiling. Like any architecture, it demands diamond-like precision. In fact B.K.S. Iyengar teaches that the body should flow into a yoga posture the way light fills a well-cut diamond. 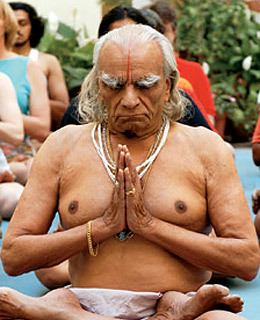 Iyengar is 85 now, and he still teaches at the institute in Pune, India, that he founded in 1973. He taught his first class in 1936, but it wasn't until he struck up a lifelong friendship with violinist Yehudi Menuhin that Iyengar brought his teachings to the West. His 1966 book Light on Yogawith 300 pages of instruction and photographs of postures, or asanasintroduced yoga to people around the globe. Aficionados founded Iyengar groups in the U.S. as early as 1974 and slowly fed what has become mainstream Western acceptance of a 3,000-year-old Indian tradition. Iyengar teaches practitioners to lavish attention on the body. The goal is to tie the mind to the breath and the body, not to an idea. His philosophy is Eastern, but his vision is universalist. You can incorporate Iyengar into your life and yoga practicebut ultimately we're Westerners on Western soil. In my acting, as in my yoga, every nuance, every detail and gesture is the subject of my focus. I'm always paying careful attention, like a pianist, and translate that attention into my performance. Iyengar knows what the body needs, and he's introduced to the West the Easterner's best path to health and well-being. The Power of Yoga: It bends. It stretches. It turns you into a human pretzel. But can it really cure what ails you?